The Alaska Purchase ( Russian: Продажа Аляски, tr. 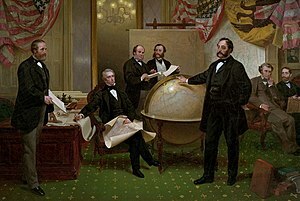 Prodazha Alyaski) was the United States' acquisition of Alaska from the Russian Empire on March 30, 1867, by a treaty ratified by the United States Senate, and signed by President Andrew Johnson. Konstantin's letter was shown to his brother, Tsar Alexander II, who wrote "this idea is worth considering" on the front page. Supporters of Konstantin's proposal to immediately withdraw from North America included Admiral Yevfimy Putyatin and the Russian minister to the United States, Eduard de Stoeckl. Gorchakov agreed with the necessity of abandoning Russian America, but argued for a gradual process leading to its sale. He found a supporter in the naval minister and former chief manager of the Russian-American Company, Ferdinand von Wrangel. Wrangel pressed for some proceeds to be invested in the economic development of Kamchatka and the Amur Basin. The Emperor eventually sided with Gorchakov, deciding to postpone negotiations until the end of the RAC's patent, set to expire in 1861. American settlers who shared Sumner's belief in the riches of Alaska rushed to the territory, but found that much capital was required to exploit its resources, many of which were also found closer to markets in the contiguous United States. Most soon left; by 1873 Sitka's population had declined from about 2,500 to a few hundred. The United States acquired an area over twice as large as Texas, but it was not until the great Klondike gold strike in 1896 that Alaska came to be seen generally as a valuable addition to American territory. ^ a b Neunherz, R. E. (1989). ""Hemmed In": Reactions in British Columbia to the Purchase of Russian America". The Pacific Northwest Quarterly. 80 (3): 101–111. doi: 10.2307/40491056. JSTOR 40491056.